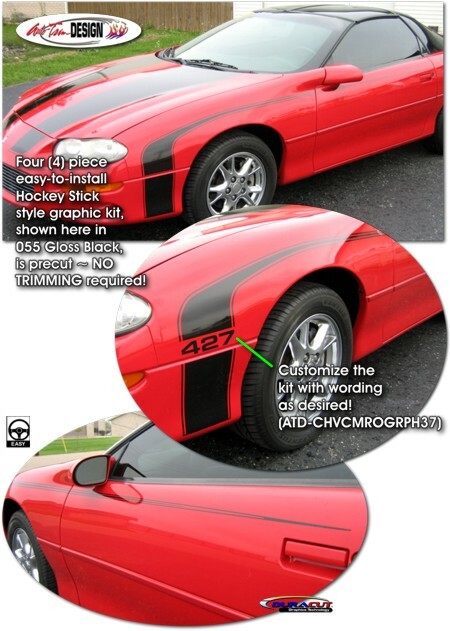 Hit the street with this awesome body side graphic kit for your '93-'02 Chevrolet Camaro. This retro "Hockey Stick" style graphic is very easy to install and features a pinstripe at each side as shown. Kit is packaged as a set of four (4) pieces. They're PRECUT and ready to install in a wide variety of colors - NO TRIMMING required! You can even select Custom Wording to be placed in the front fender area as shown. Simply enter the Custom Wording of your choice (up to seven  letters/digits/spaces) and we'll make it happen! This stripe package is not just a set of straight strips in a box. Our graphic kit consists of prefitted and contoured pieces that are specifically made for the '93-'02 Chevrolet Camaro and will not fit any other vehicle. Stripe is created to follow the Camaro's distinct top body lines as shown.